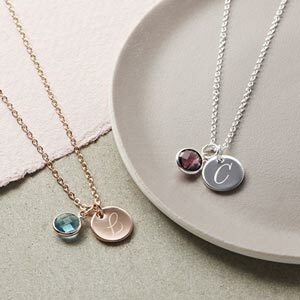 The Sia Sterling Silver Initial Necklace is a sterling silver disc with an integrated hanging loop that can be engraved with a script initial and paired with a delicate trace chain. A classic necklace full of sentiment. The Sia features a delicate trace chain and a 12mm disc with an integrated hanging loop. The disc can be engraved with an initial on the front and up to eight characters on the back in a stylish script font. 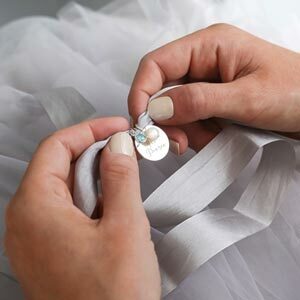 The perfect way to treasure a special moment or memory forever by adding your children's names, your loved one's birthday or maybe your wedding date. Such a lovely necklace, fantastic quality. I absolutely love this necklace, my children's names are inscribed on it and I have had loads of compliments about it already! Beautiful rose gold finish. The disk isn't too big or too small. Love the fact you can personalise it. Only negative I would say which the recipient commented on is that you can't see the personalisation initial that well but that's just down to personal taste I guess. However it was well received. Beautiful gift for my bridesmaids. Excellent. 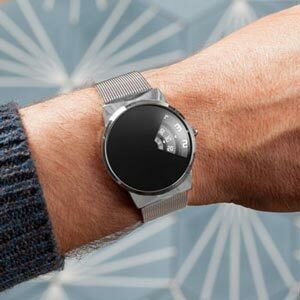 Products arrived quickly and were as expected. Will certainly purchase from bloom boutique again. Gorgeous necklace, great quality, fantastic price. Lovely gift, well presented, reasonable price. Would recommend. Nice pendant length, nice engraving. slightly annoying that the piece is considered 'costume jewellery' and therefore can't be in contact with water etc. - suggests not very good quality. but a nice piece. Beautiful christmas gifts for my daughter's. I would have given in it 5 stars but the engraving on the back was incredibly small, way too small given the size of the pendant. Otherwise it is a beautiful and simple necklace. Lovely item, my daughter loved it.